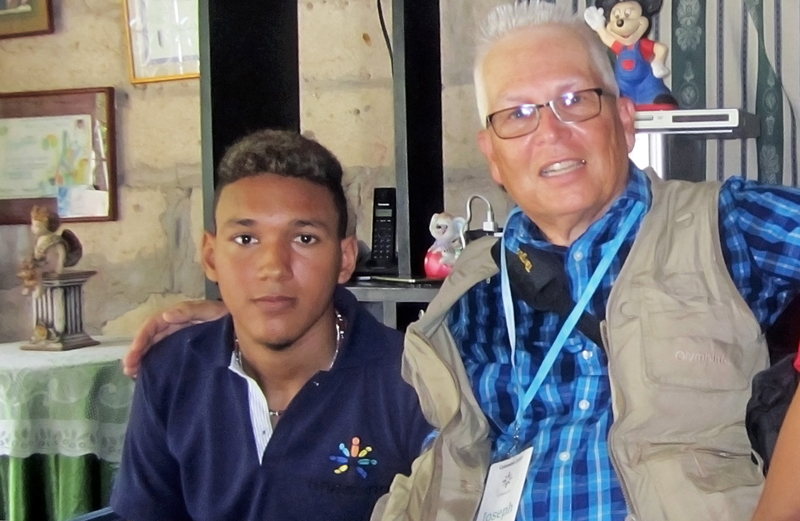 Sponsor Joseph Rivard (right) visits with his sponsored friend, 17-year-old Jan Sebastian, at Jan’s home in Colombia. Unbound sponsor Joseph Rivard of Gulfport, Mississippi traveled to Colombia in May on an Unbound Awareness Trip. 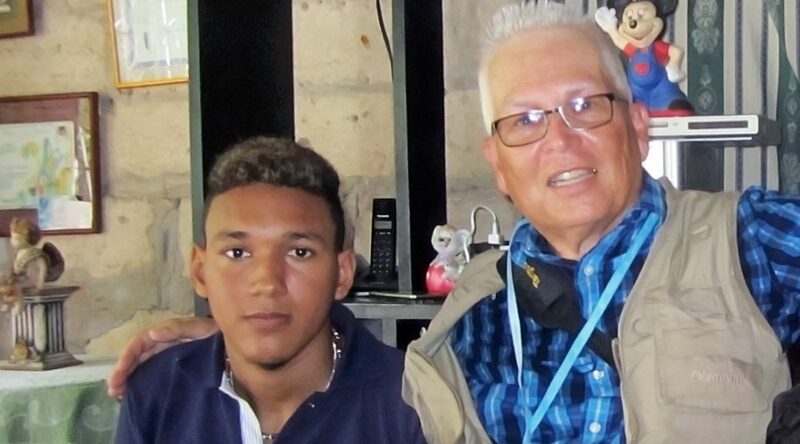 He joined Unbound as a sponsor less than a year before the trip, and sponsors three young men in Latin America. Joseph is a retired professor of psychology at Central Michigan University. He reflects on how the trip impacted his faith. Like most Americans and others living in a “first-world” country, life is never perfect. Every Christian I know has a story to tell; stories that speak of the death of a loved one, sickness, stress in a career, family trouble, etc. Each of us, armed with faith, endeavor to overcome our own struggles. We journey through our lives doing the best we can to work through our own deficiencies while trying to understand and serve God in the midst of our confusing and sometimes tumultuous life journey. When I left for Colombia in May, I knew this trip would be different from other mission-style trips I have made in the past. I knew it would be different, simply because God is always about things “now” and “new.” There were a lot of things in my life journey that could have justified not going on this trip, because life is that way — always filled with challenges and obstacles. Yet, whenever I quieted my worries, I was convinced in my heart that this trip was something God was calling me to do. He didn’t command me to go; God has never arbitrarily demanded things of me in that way. It was more of a gentle stirring and a pull on my heart that communicated invitation and opportunity. Much has been said of Unbound as it relates to its organizational efficiency; the quality of the Unbound staff members both stateside and internationally, and the comprehensive and competent manner with which every Unbound trip is planned. All of that is true and I concur with all the good things you have read or heard from others about this amazing organization. Unbound is not “preachy” toward any traveler and faith is never force-fed on anyone. Unbound greets each traveler knowing we all experience God in different ways. Some of my co-travelers were seekers, some were in a desert place, some were buoyant and faith-filled. In the end, it didn’t matter. What mattered was that we showed up! For all those reasons and more, I now try to spread the word about Unbound to others in my church and community. As we said our goodbyes at the end of our little pilgrimage to Colombia – each of our hearts were full and our sense of God in those we met, sponsored, and worked with along the way was overwhelming. When I was 17, I wondered what it would be like to fall in love. Even at 17 the one thing I did understand about falling was that it could happen fast, it could get out of control, and all of the control I liked to think I had in life might be surrendered by that fall. But in this case, I let myself fall for God’s invitation, and I can pretty much guarantee that on the Unbound trip God calls you to, you will fall, too. At times, you may feel you are in over your head and, like Dorothy of Oz, it will become clear you’re “not in Kansas anymore.” But falling for an invitation from God is never bad. All of our lives have struggle. But when we muster the courage to leave our world and enter the lives and worlds of others, we gain new perspectives and attitudes. We become ever more aware that life is difficult for all, just in different ways. Somehow, we are all united by whatever ways we struggle in our lives. We are different, but not that different. It is the unity of our shared human experience that brings us to understand and love each other better. I remember something Jesus once said to Simon. “Launch out into the deep and let down your nets …” (Luke 5:4). Deep places can sometimes seem scary. What God calls you to may seem deep and scary. As you think about supporting Unbound in finance or travel, it’s human nature to wonder, “What about the cost, what about safety, what about the world I leave behind, what will I have to sacrifice?” To those natural and human concerns, we need only witness what happened when Simon let go into the deep. His nets became full, and his heart was overwhelmed. As we said our goodbyes at the end of our little pilgrimage to Colombia, each of our hearts were full and our sense of God in those we met, sponsored and worked with along the way was overwhelming. It is fair to say that having cast our nets deep in the beauty of Colombia, we all fell in love.